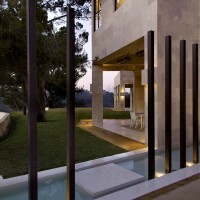 The Agency have sent us photos of a recently listed home for sale in Bel Air, California. 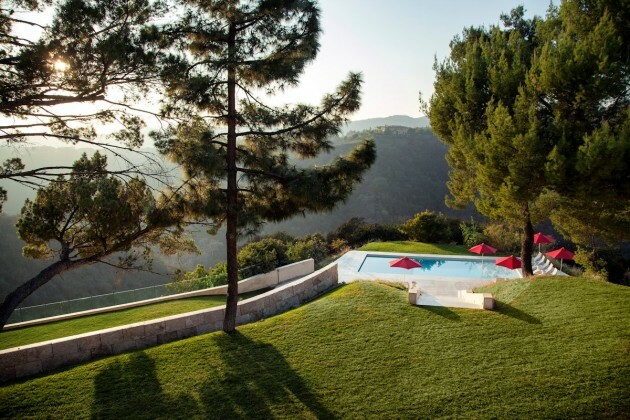 This recently-constructed compound sits at the end of a very long, gated drive overlooking 350-acre untouched Hoag Canyon, and the surrounding scenery and privacy are unlike anything else in Los Angeles. 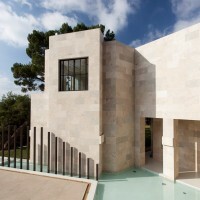 Reminiscent of Richard Meier’s Getty Museum, the home is encased in beautiful Travertine stone. 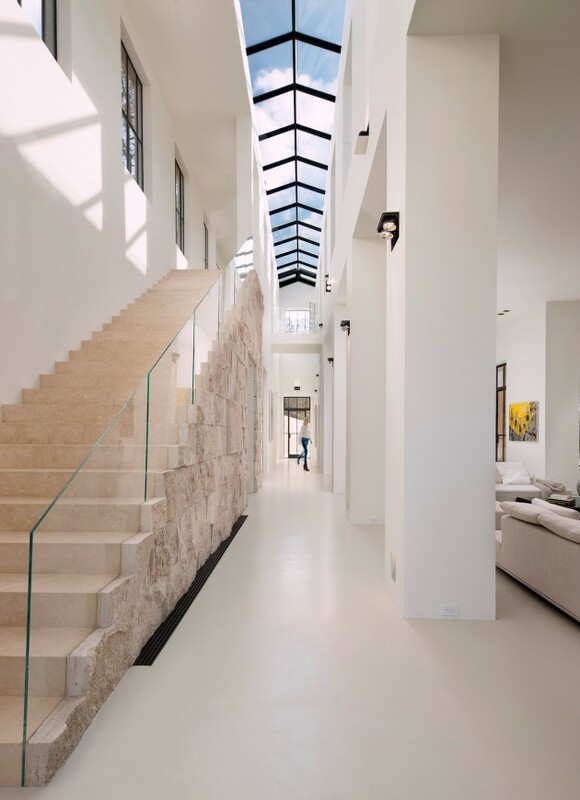 It features monumental scale and proportion, large disappearing glass doors and an organic and seamless indoor-outdoor flow. An impressive reflecting pool welcomes guests and enlivens the entrance. 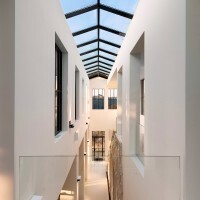 With 14-foot high ceilings and a 34-foot high central gallery with a roof-long skylight, this home is an art collector’s dream, suited to both private contemplation and large-scale entertaining. The superb chef’s kitchen (which features a breakfast area overlooking the reflecting pool, a large center island, and integrated Miele/Wolf appliances) can be closed off for catered affairs or left open to the voluminous living and dining areas. A dramatic library peers down through a glass floor into the walk-in wine room, as well as looking out to the sylvan “amphitheater” (perfect for your next TED Talk). A sumptuous guest suite is also located downstairs. Upstairs resides the master suite, with its light-filled, spa-like bathroom, a roomy dressing room/closet resembling a tony boutique, and an extensive outdoor deck with fireplace and broad views. Also upstairs is a large office (which has been plumbed in case one wanted another bedroom suite upstairs). A guest house with permitted kitchen, sliding glass walls that leave you “floating” over the colossal view, and a three-car garage lay across the motor courtyard. 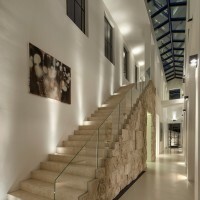 The 3.2 acre property is just as captivating as the architecture. In addition to the endless hiking trails, the property features a swimmer’s and diver’s pool with a sun-drenched pool deck; two separate lawns; and an entertaining loggia with its own fireplace. Daylight is engaged as an architectural element throughout the house, pouring in at every angle of opportunity; the path of the California sun creating ever-changing experiences and moods like moving art. Night is just as dramatic with its symphony of stars, the flickering of flames, the shimmering of illuminated water and the thoughtfully-designed landscape lighting. 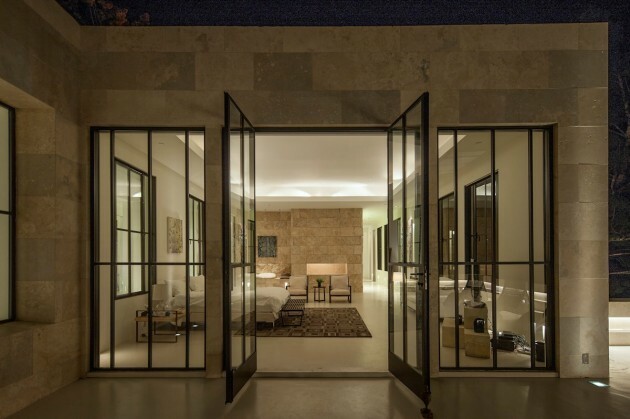 Once you have settled in to this architectural retreat, it is easy to forget that you’re only minutes away from the best of what Los Angeles and Beverly Hills has to offer.